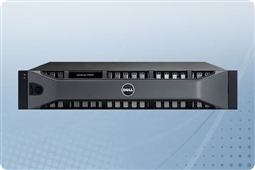 The Dell EqualLogic PS6100X an excellent balance for any IT Professional or SMB seeking performance, capacity, and versatility in their application storage solution! The PS6100X has the easy to understand management, integration with VMware, and high performance we expect from the EqualLogic PS Series, and the additional bonus of 24 2.5” hard drive bays and capacity up to 21.6TB. This SAN perfectly positioned for being shared storage for applications or databases with excellent host connectivity from its Dual 4-Port 1GbE iSCSI Controllers and faster 10K RPM SAS HDDs. Aventis Systems offers a 3 Year Essentials warranty on all Dell EqualLogic PS6100X SAN Storage Arrays with optional Secure Drive, Extended, Express, and Onsite warranty upgrades. So shop below and find the perfect EqualLogic PS6100X Storage to balance your speed, storage, and connectivity requirements! Curious if the Dell EqualLogic PS6100X SAN (Storage Area Network) arrays are right for your business continuity and budget? Check out our Survival Guide: Avoiding A Data Apocalypse today! 28.8TB (24 x 1.2TB) 10K 6Gb/s SAS 2.5"
21.6TB (24 x 900GB) 10K 6Gb/s SAS 2.5"